Handsome collection of ten antiquarian novels in green cloth bindings. They feature gilt decoration and lettering. Total size of the books are 15" x 7.5" x 5." 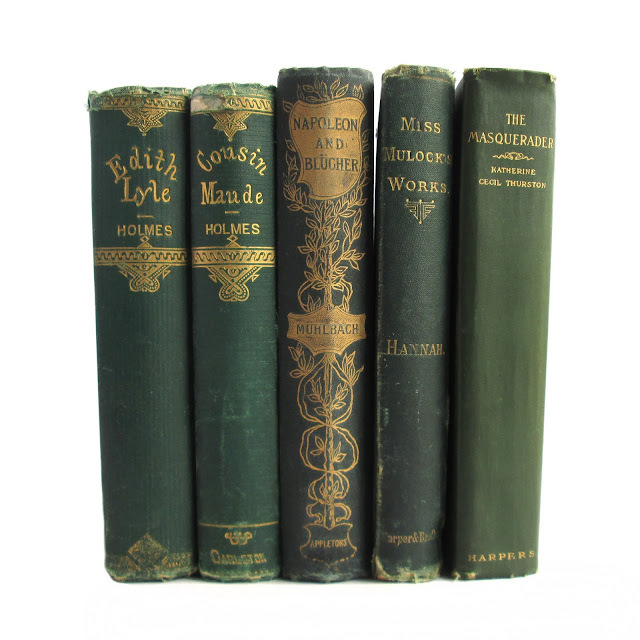 Novels by John Galsworthy, Mary J. Holmes, E.P. Roe and more. Detailed descriptions below. THE GREAT MISS DRIVER Hope, Anthony Doubleday Page and Company Good 1912 This 5"x7.5" ANTIQUE, HARD COVER BOOK has a green cover with gilt lettering on the spine of the cover. 420 pages. Good condition with owner's label, tanned pages, wear, and soil. HANNAH Mulock, Miss Harper & Brothers Fair 1872 Part of "Miss Mulock's Works." 310 pages. Approx. 4.5"x7.5". 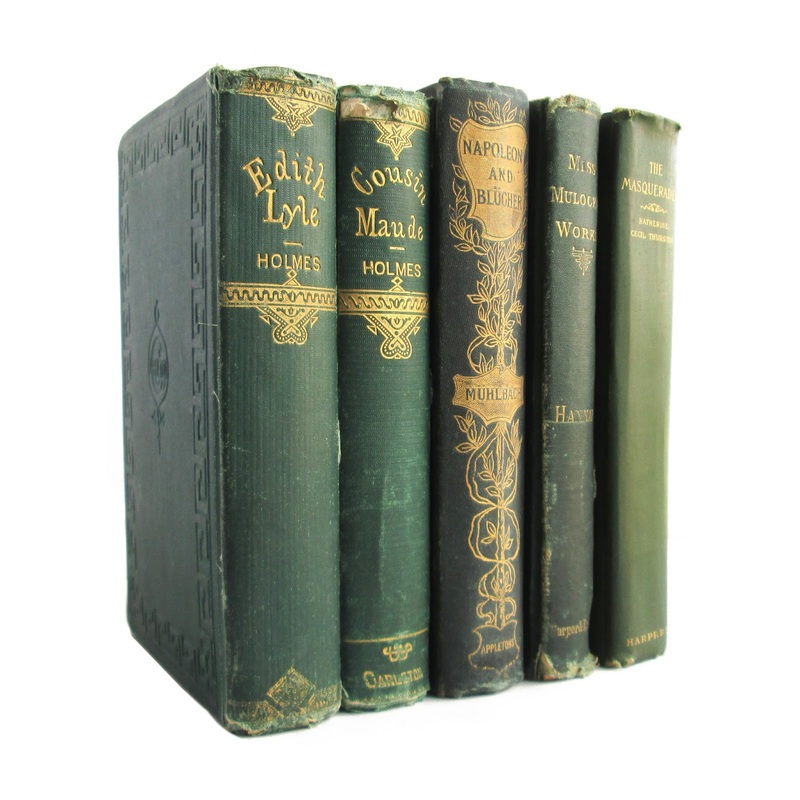 Green cover with bright gilt-lettering on spine and front. Edge wear on spine, tanned pages, some foxing, slanted and faded spine, rubbing, wear and soil. Fair, worn condition. Gilt Miss Molock signature impression on front. Full page b&w frontispiece; "Oh, give me one kiss, Hannah, to last me all these months and years." Neat gift inscription on pre-title page. EDITH LYLE Holmes, Mrs. Mary J. G.W. 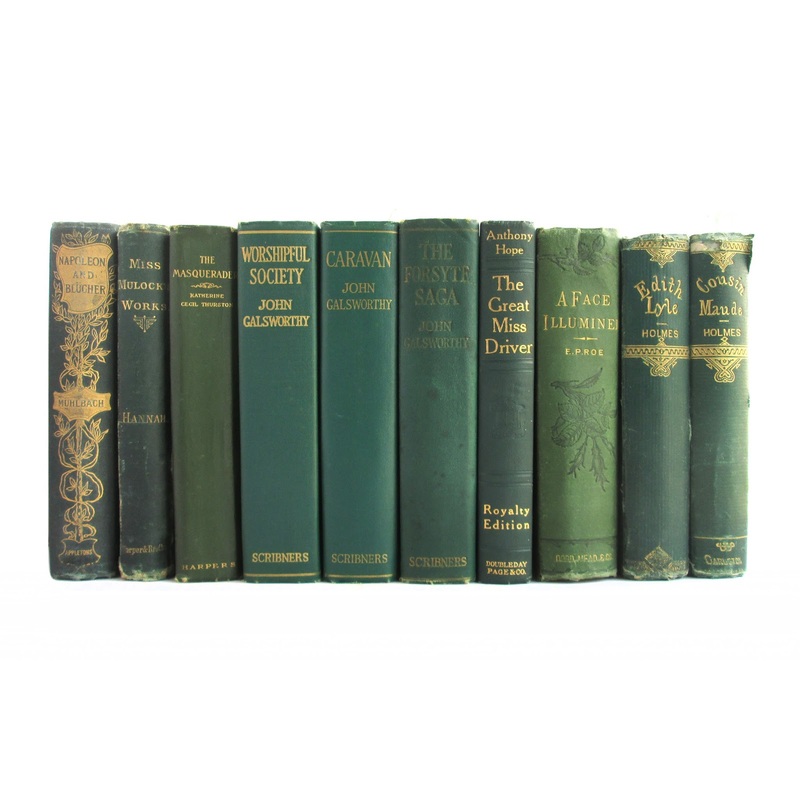 Carleton and Co. Fair 1876 This antique hardcover book is bound in dark green boards with bright gilt lettering on the spine and a decorative geometric border on the cover. Book is in good condition with tanned pages, faded spine, rubbing, wear and soil. 420 pages; approx. 5"x8". A FACE ILLUMINATED Roe, E.P. Dodd, Mead & Company Good 1878 This 5 x 7 hard cover book has gilt lettering on the green spine with a green/floral decorated cover. 1878 1st edition. 658 pages. Some foxing, cocked and faded spine, wear and soil. Good condition. 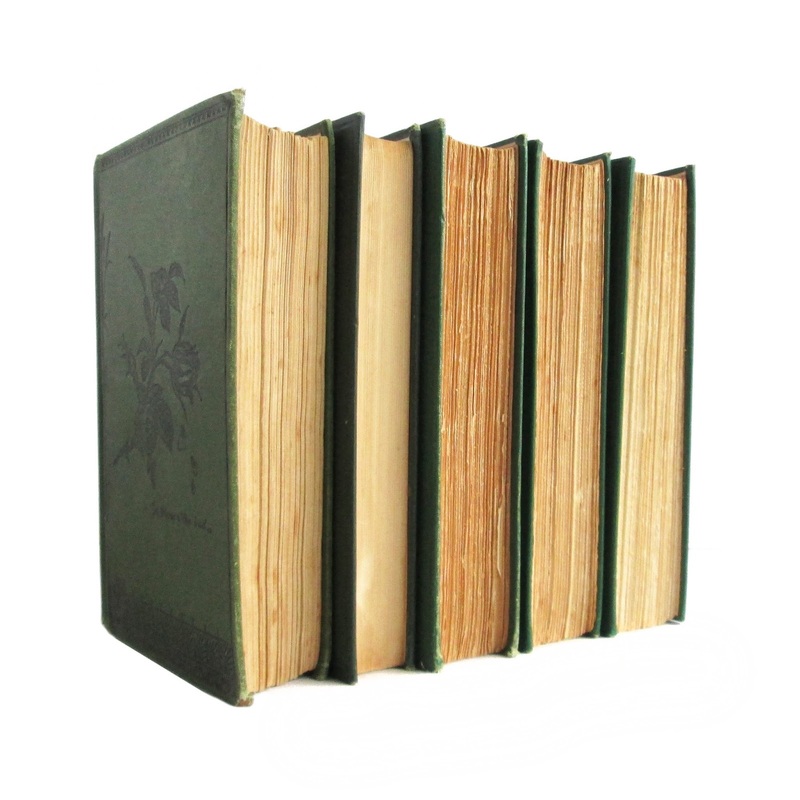 THREE MATCHED VOLUMES OF GALSWORTHY Galsworthy, John Charles Scribner's Sons Good 1932 This collection of Galsworthy novels is bound in green cloth boards with gilt lettering on the fronts and spines. 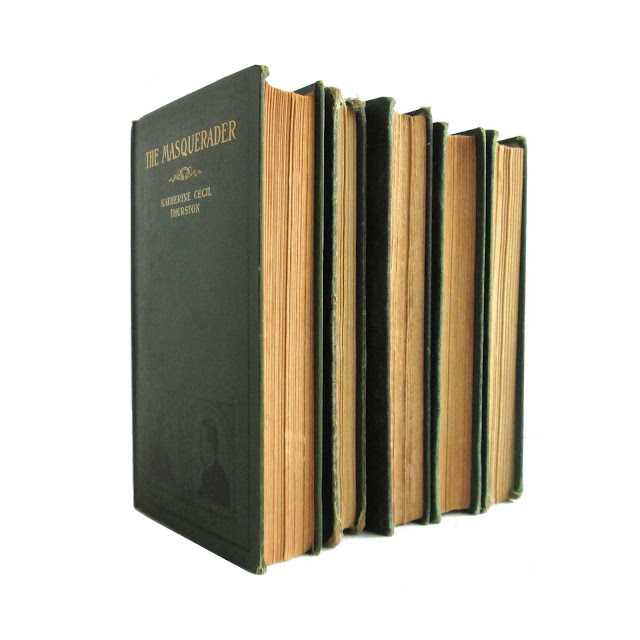 Books are in good condition with writing on the foredge, tanned pages, edgewear, and soil. 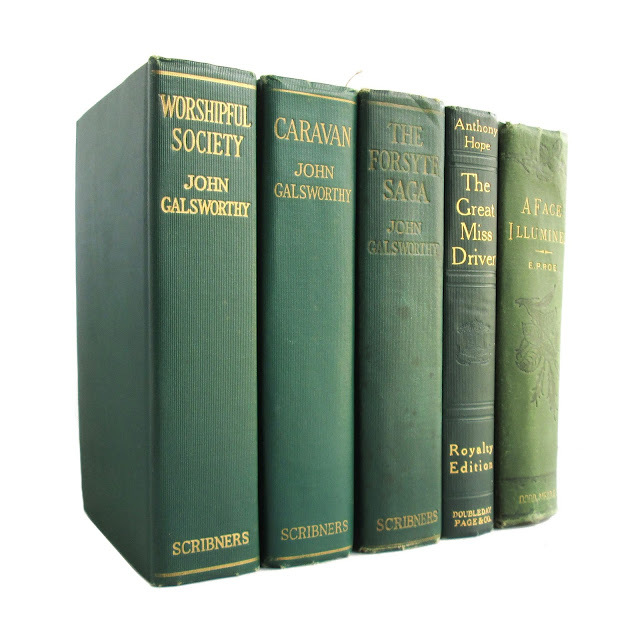 Included are the "Worshipful Society" series, three books in one volume, 1932; "Caravan: The Assembled Tales of John Galsworthy," 1928; and "The Forsyte Saga," 1926. Each is approx. 800-900 pages, 5"x8". 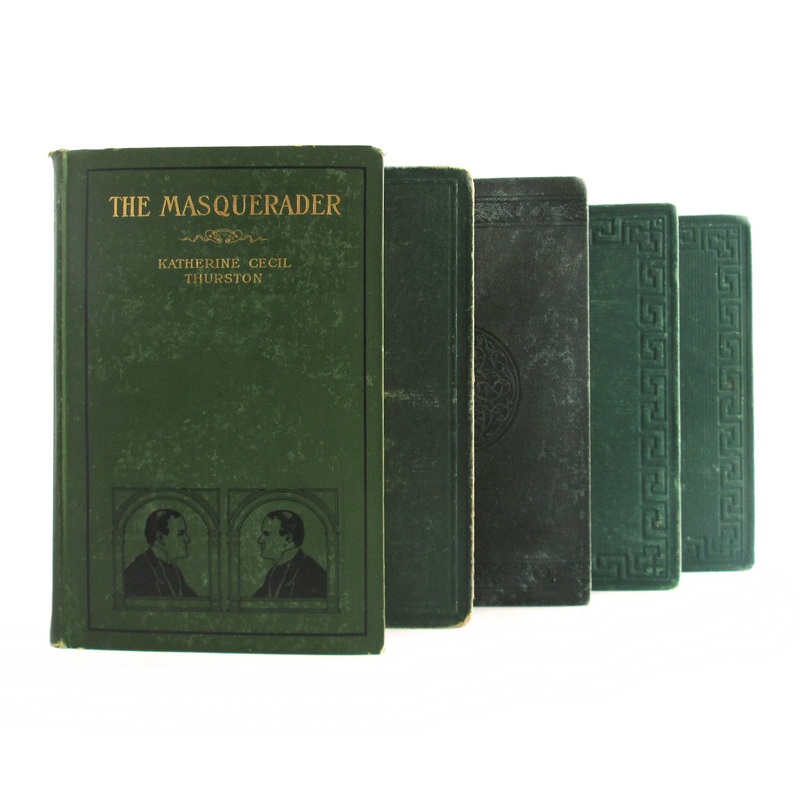 The Masquerader Thurston, Katherine Cecil Harper & Brothers Good 1904 5.5 x 7.5 hard cover book. 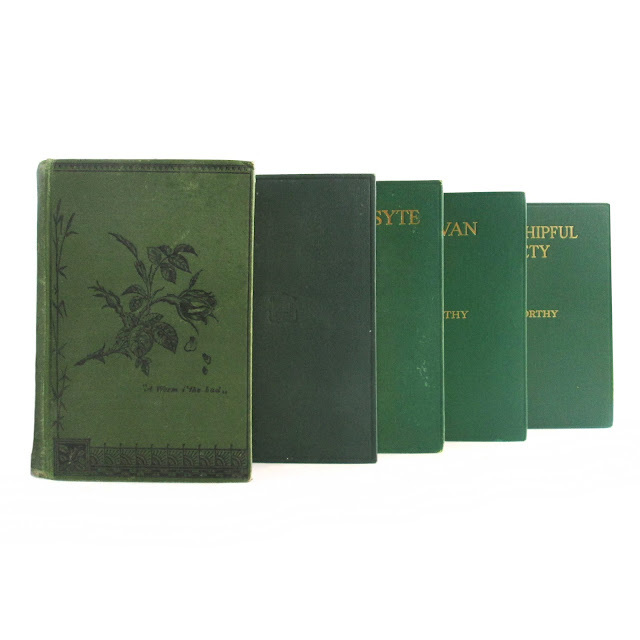 Gold lettering on the green spine with a green and illustrated cover. Antiquarian fiction. 327 pages. Spine ends and corners worn. Good condition. Cousin Maude and Rosamond Holmes, Mary J. Carleton Publisher Good 1860 Two books in one by Mary Holmes, "Cousin Maude" and "Rosamond." Book is in good condition with scuffed cover, edgewear, spine chipping and tears, owner's name, browned pages and embossed stamp. 374 pages, 7.5 x 5. Napoleon and Blucher Muhlbach, L. D. Appleton and Company Fair 1893 Heavy cover wear and soil, some library markings. Pages are slightly toned. 5"x7.5" with 507 pages. Illustrated.